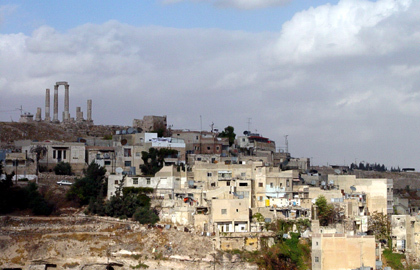 In the heart of Amman is the ancient citadel today called Jabal al–Qal’a. This 2790 ft. [850 m.] high “L-shaped” plateau was the acropolis of the ancient city during the Bronze and Iron Ages – as well as during the Roman, Byzantine and early Islamic Periods. The structures on the top of include the “Temple of Heracles/Hercules,” a Byzantine Church, a variety of Umayyad structures, and the archaeological museum.